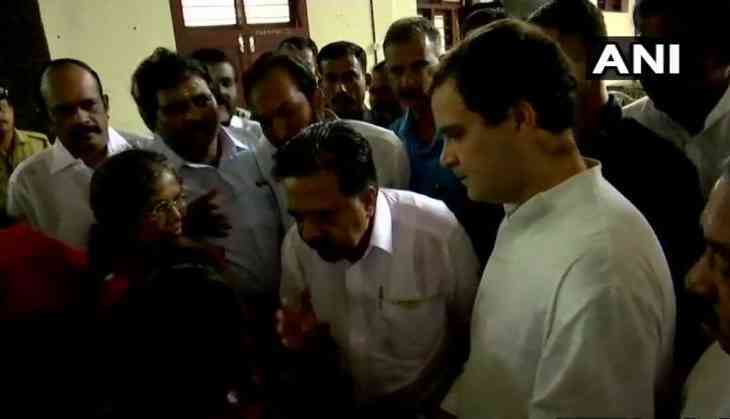 Days after floods ravaged Kerala, leaving a massive trail of destruction, Congress president Rahul Gandhi today visited relief camps in Chengannur and heard the woes of the people. Gandhi, who is on a two-day visit to the state, arrived in Thiruvananthapuram this morning from abroad. He then took a helicopter to Chengannur in Alappuzha district. The Congress chief first visited the relief camp at the Christian College here and spoke to people at the centre. He also visited a camp at an engineering college. Leader of Opposition in the Kerala Assembly Ramesh Chennithala and Congress's state unit president M M Hassan were among those present at the camps. He will also be meeting fishermen and party volunteers involved in relief work. According to data released this morning by the Disaster Management's state control room, 474 persons have died in the rains and floods since May 29, when the South West Monsoon set over Kerala.